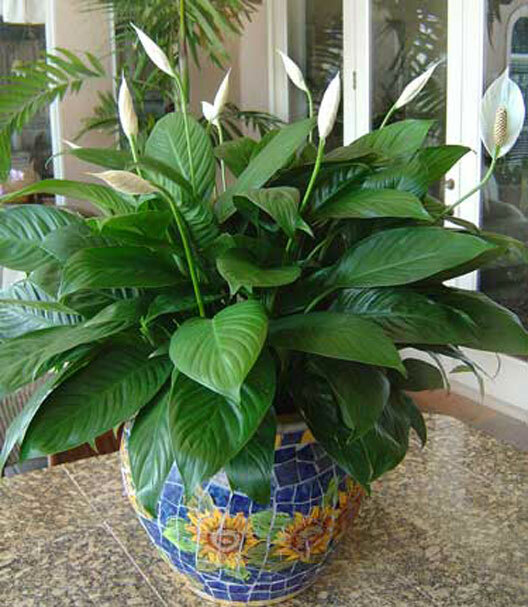 Spathiphyllum – an exciting new hybrid with shinny leaves. ‘Moonlight Bay’ Aglaonema, (PPAF), is a mutation discovered within a population of ‘Silver Bay’ Aglaonema plants. Mature Aglaonema ‘Moonlight Bay’ leaves are lance shaped and reach 5 to 6 inches wide and 10 to -12 inches in length. Leaves exhibit an uneven and sporadic central gray-green area that extends from each side of the midrib towards the margin. In some spots, this gray area is very narrow while in other is covers half the leaf surface from midrib to margin. Leaf margins are dark green and connect with the lighter gray colored central area along irregular borders. The undersides of the leaves are lighter green. Leaf margins are smooth and leaf tissue on either side of the midrib tends to be of slightly unequal widths. This results in curving or waviness of the leaf towards the narrower side. The leaf petiole is a light yellow green in color. The stem color ranges from areas that are a darker yellow green to lighter areas in the same color range. The stem and petiole colors are not normally visible due to the thick canopy of foliage. Want to learn more about Professor’s Pride? Read the history on Professor’s Pride here. This new foliage plant makes an excellent interior plant for homes or offices. ‘Emerald Bay’ Aglaonema, (PP12,867), was selected as a vegetative sport from ‘Golden Bay’ Aglaonema. Emerald Bay lacks the yellow background coloration present in normal Golden Bay leaves and petioles. The single stem sport was increased by stem cuttings and studied at MREC-Apopka for stability and performance. Aglaonema ‘Emerald Bay’ remained stable after propagation, maintaining its new foliar pattern and other desirable traits of the Golden Bay parent. Emerald Bay leaves can be 4 to 5 inches wide and 12 to 13 inches long. The leaf margin is smooth and the leaf tissue on either side of the midrib tends to be of unequal widths, resulting in a slight curving of the blade towards the narrower side. Leaves exhibit a central gray area that extends out from each side of the leaf midrib to cover slightly over half of the total leaf surface. Leaf borders are dark green and intersect the lighter gray colored central area along irregular borders. This overlap creates small distinct patches of a third color that is a darker gray green color. Emerald Bay Aglaonema performs exceedingly well under interior conditions. ‘Diamond Bay’ Aglaonema, (PPAF), is a sport from Aglaonema ‘Silver Bay’ that was noticed because it lacked one of the foliar variegation patterns normally present in ‘Silver Bay’ leaves. The ‘Diamond Bay’ selection was increased by stem cuttings at MREC-Apopka and studied for stability and performance for 2 years. Aglaonema ‘Diamond Bay’ remained stable while maintaining its new foliar pattern and other desirable traits of its parent. Mature Aglaonema ‘Diamond Bay’ leaves are 4-5 inches wide and 11to 12 inches long. Leaf margins are smooth and the leaf tissue on either side of the midrib tends to be of slightly unequal widths. Leaves exhibit a central grey-green area that extends out from each side of the midrib to cover slightly over half of the total leaf surface. Leaf margins are green and meet the lighter gray colored central area in an irregular pattern. The undersides of the leaves are uniform green.